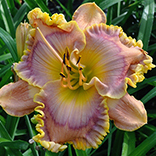 (Dan Trimmer, 2004) Tetraploid (London Calling X Seedling) 25" EM Re. Ev. 6 ½" This very large ivory blushed pink pastel was the best performing cultivar in my garden this past year. In early October when I dug to divide I had to cut off blooming scapes on plants that had been blooming since late April. The pollen parent for ACROSS THE UNIVERSE came from a Larry Grace Seedling involving Tetra Siloam Ralph Henry and J.T. Davis. The very round full form, gold edge, deep looping ruffles plus early results in my seedlings enticed me to make this one my most used pollens this past season. 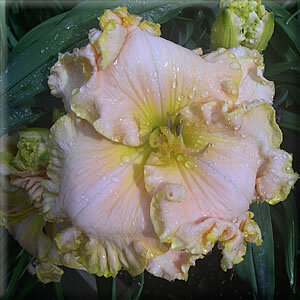 Many early blooms were 7" with 4" petals and were consistently as "extreme" as the image presented, and later blooms were still 6 1/4 6 ½". ACROSS THE UNIVERSE is fertile both ways with a typical bud count of 20 25 with two lateral branches. Limited as much of the stock was reserved by garden visitors last summer.